Good evening, folks! 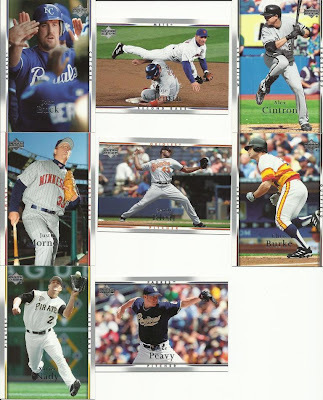 Tonight I am opening a pack of 2007 Upper Deck Series One. There are exclusive Cal Ripken Jr inserts to be had. And, of course, there are 8 cards per pack. Let's get crazy. Well, once again, we have several players here that appear to be free agents. So, this next draft should be lots of fun to watch unfold! Congratulations Josh and Thorzul for being the only two managers to draw players out of the pack. Note to self: that Chris Burke card is sweet, pick him first in the draft.